Are you searching for a small town to call “home”? Look no further than Carrboro, North Carolina! What started out as a small mill town has transformed over the years into one of the most progressive communities in the Southern United States. Carrboro’s Century Center—which lies right in the middle of the community—is a little over two miles away from the University of North Carolina at Chapel Hill’s most recognizable symbol: The Old Well. Aspen Square Management has three gorgeous properties located in the heart of Carrboro: Collins Crossing, Berkshire Manor, and Berkshire Manor West. Berkshire Manor offers two bedroom apartments, Berkshire Manor West offers both one and two bedroom apartments, and Collins Crossing offers a combination of two and three bedroom apartments for rent. Because of their centralized locations, residents can hop onto one of the many bus lines that make up Chapel Hill Public Transit and get anywhere they need to go in the towns of Carrboro, Chapel Hill, and Durham—and they can do it for free! Are you a student at the University of North Carolina at Chapel Hill and are in search of off campus apartments near UNC? Well, we have the place for you! 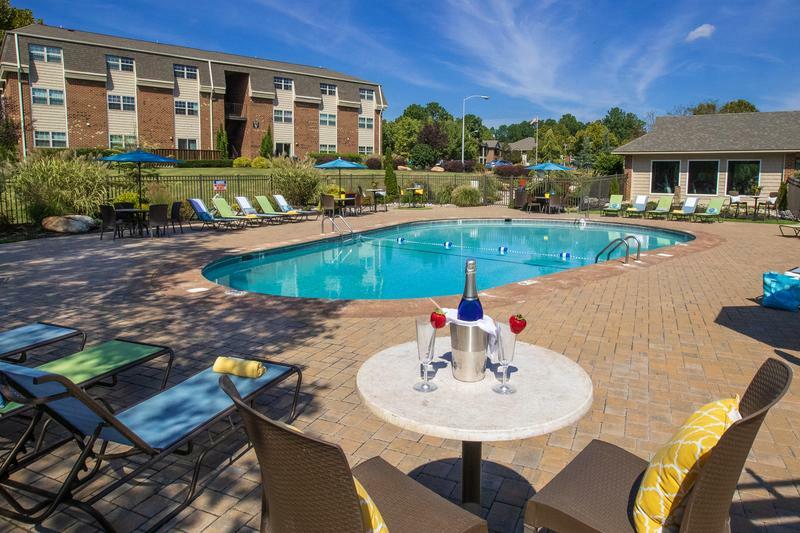 All three of our Carrboro apartments for rent are located just minutes from campus. Because our apartment communities are located along the free Chapel Hill transit line, getting to campus will never be an issue! All three of our communities offer wonderful amenities that take apartment living to the next level. The lush landscaping offers a sense of peace and tranquility in the midst of the hustle and bustle of living in a college town, and the option of renting an apartment with a private patio or balcony is a plus! The resort-style pools and expansive sun decks at each property—not to mention the shady poolside cabanas—are popular hang-out spots for residents during the warm summer months. Residents can also enjoy other perks of living at our fantastic communities, including a free Platinum O2 Fitness membership and access to top-notch basketball, beach volleyball, and tennis courts. Because Carrboro is pet-friendly, our three Aspen properties in Carrboro offer pet friendly apartments. We welcome dogs and cats alike, because a home doesn’t truly feel like a “home” without the company of four-legged friends! Being located near UNC Chapel Hill and dozens of other nearby colleges, Carrboro offers an abundance of higher education options. Other colleges and universities in the area include Duke University, ITT Technical Institute Durham, Durham Technical College, North Carolina Central University, the Art Institute of Raleigh Durham and so much more! There are 38 different colleges within a 50 mile radius of Carrboro, so you will be sure to find the right fit for you if you plan on making the move to Carrboro. Since Carrboro is situated so closely to The University of North Carolina at Chapel Hill, it is filled to the brim with many entertainment possibilities- including local restaurants, art galleries, and music venues that cater to the wide variety of tastes that make up the diverse communities of both Carrboro and Chapel Hill. Just a short walk or bike ride from our communities is a veritable foodie’s paradise: From Turkish and Greek food to good old-fashioned hamburgers made from locally-sourced beef, Franklin Street in Chapel Hill has it all! On your way home from dinner, you’ll pass by more local boutiques, hair salons, and comic book stores than you could possibly count. Carrboro also has the honor of calling home two music venues that host local, regional, and national acts: The ArtsCenter and Cat’s Cradle. The DSI Community Theatre and the Carrboro Farmer’s Market are also hot spots for locals. Throughout the year, the town of Carrboro hosts a multitude of community events, including the annual Carrboro Music Festival, the Carrboro Film Festival, and the North Carolina Comedy Arts Festival. The town of Carrboro is also part of the Raleigh-Durham-Chapel Hill metropolitan area, which is also referred to as the “Research Triangle.” The Research Triangle Park is now the largest research park in the country, made up of over 200 companies and over 50,000 experts in the varying fields of microelectronics, telecommunications, biotechnology, pharmaceuticals, and many, many more! Needless to say, there are endless employment opportunities within Carrboro and the surrounding areas. Carrboro, North Carolina is a truly one-of-a-kind town that combines a modern vision of the future with the comforts of classic Southern living at its best.